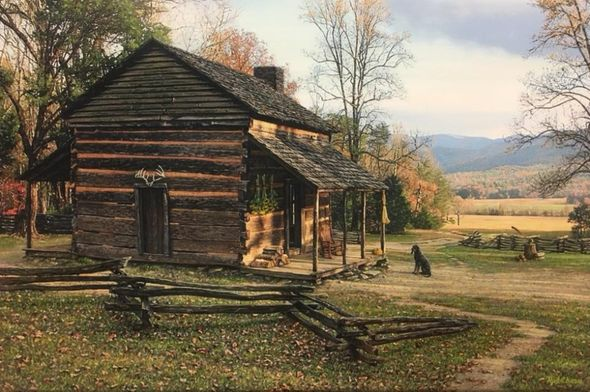 Rod Chase Artist Hand Signed and Numbered Limited Editon Canvas Giclee:"Autumn in Cades Cove"
Edition / Medium : Limited Edition Canvas Giclee to 195 with 25 AP's. COA included. About the Art: As one of today's finest and most recognized photorealist painters, Rod Chase has earned the highest respect of his peers and the admiration of legions of collectors. Each painting from the artist's easel is a masterpiece created from extensive research and numerous photographs of each of his subjects. This technique, along with the aid of historical photographs, results in a timeless quality in each of Chase's works. In his quest for mystique, accuracy, and a true sense of history, Chase does extensive research. His travels have led him from New York and Washington, D.C. to Colorado and California and finally to Italy in a never-ending search to obtain materials and photography for new paintings. The talented artist says, "Being a photorealist, I am dependent on finding accurate reference material for each painting." Chase works with acrylics on canvas, spending hundreds of hours on each painting with the ultimate goal of presenting a fresh, unique, and elegant approach to familiar subjects. The detail in each painting is remarkable, but the mood each is equally impressive. Chase is acknowledged as a master of breathtaking scenes depicting our country's natural and historical treasures. He has painted images of such famous landmarks as The White House, the Capitol, and the Supreme Court building to name a few. As a naturalized citizen, he felt honored as well as professionally challenged to paint these subjects. Chase also paints magnificent foreign landscapes. His travels in Italy inspired him to paint St. Peter's Basilica and the romantic canals of Venice. The artist's outstanding talent in his use of light is evident in "The Glory of San Pietro" and "The Mists of Morning." Without traveling to these world-famous locales, the viewer is able to feel as if the scene is unfolding before them in person. Rod Chase is represented by Greenhouse Gallery of Fine Art in San Antonio, Texas. He is published exclusively by Somerset Fine Art. Chase, a native of Canada, and his wife live with their five children in the Texas Hill Country. In 1999, he became a United States citizen.